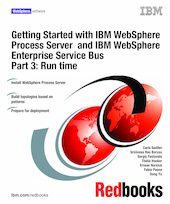 This IBM Redbooks publication provides new users with information about how to install and configure IBM WebSphere® Process Server and IBM WebSphere Enterprise Service Bus runtime environment. It includes installation examples on distributed, i5/OS®, and z/OS® platforms. It also provides basic configuration information for deploying applications. Some knowledge of IBM WebSphere Application Server Network Deployment is assumed for the readers of this book.